I'm breathing easier now though there is still so much to do. I can't say thanks enough to all the great people who are helping get Crossroads UMC launched. Last night was our first practice and it was a great night. So many did so much. The worship team of Wes, Robert, Sara and led by Brandon Reeves were incredible. It meant a lot to read Ashley's blog, "Awesome God." It really was more than practice. From the hands and feet who served all around, the prayer Jim prayed with Brandon and me, the children playing and coming to receive communion, the help from Cedarcrest Church, the people who came and gave of time and offerings, it was all worship. And in the midst of it was my sermon, one that was as much for everyone as it was for me. It was called, "Keep It Simple" and was on Luke 18:10-14, the story of the pharisee and tax collector. And today, as I reflect on what has happened these past two years, what happened last night and what may happen in the future, I can't help but hear God's words to me, "Keep it simple." By His grace, I hope to do just that. Thanks God for allowing me to play a part of this new church, this new work of the Kingdom. First Practice Is This Sunday Evening!!! This Sunday evening will be our first practice service! Thanks to George Wright and the folks at Cedarcrest Church, we've been given a great opportunity to celebrate what God has done and prepare for what is going to happen. 4-5pm Set-up and Prepare: Our worship team will plug in and warm-up. Greeters will practice and prepare for guests and the service. Some of our young people will practice the role of acolyte. We'll try out our flags at the entrance and set-up the communion table. 5-6pm Worship Service: We will have an actual worship service. A special offering for Murphy-Harpst and Backpacks for Back to School will be taken. We will also have a sermon and communion. We won't be doing children's ministry or nursery but we will have some special space for families with children and activities for them. Parking will be in the side lot near the gym/sanctuary. We will have flags and banner at the entrance for you to come. The school locks down the rest of the building @ 3pm. For directions, get our simple map. When you grow up in a home where your dad is not only an accountant but teaches accounting, you learn about money. It is interesting to consider too, my dad's career, because he didn't grow up with money. My grandfather was a farmer in west Texas and then spent over 30 years working the oil fields for Gulf. The most important lesson on money came when I wanted a new bike. "Everyone else" had cool dirt bikes and I had an old hand me down. I picked out this beautiful white Murray with red and white accents in a Wal-Mart flyer. When I went to dad about this need in my life, his response? Buy it yourself. So I went to Wal-Mart and put it on lay away. It seemed like months went by and they did, but finally I scrapped together enough to make the purchase. That was one of the best days of my life. Oh, not the day I brought the bike home, but the day my dad said to buy it yourself. I did not like it then but I sure do now! It was a lesson that I have drawn on over and over and one I'm trying to pass on to my kids. With the continuing struggles we are all having, that lesson my dad taught me maybe even more important and relevant. Recently, Church Relevance posted a blog on the10 Theories on High Gas Prices and Church. High gas prices will do two things: reorganize the church into community oriented ministries and reveal the out of order finances in America. I'm thankful for the simple lessons pop and mom taught me and the ones I can pass down. Shortly, we'll return to being debt free with our last car payment (which wasn't much to start with) and excluding our mortgage. It may not be easy to live within your means but it sure beats living outside of them! When did Jesus ever live beyond his means? The disciples? Take a glance through the book of Proverbs. Looking through the Bible, you find the same results with greed and abusing money as you do with having multiple wives and concubines: problems. May I Ask: Is the financial situation in your home and in our country impacting your life yet? Your church? What are you doing about it? May I Suggest: Consider your faith and your finances. Are they compatible? Does it in fact, cause you stress and anxiety? If it doesn't, do you credit your faith or habits? 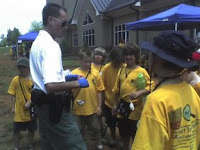 Check out the Shepherd's Helpers @ Jarvis Memorial UMC. It is a great ministry my dad helped to found. That would be worth tuning into every week. Got 30 seconds? Then get your Star Wars fix. It is the summer season, the time for VBS and Day Camps. This week over 200 boys and a few girls along with a host of leaders, have converged for the inaugural Pickett's Mill Cub Scout Day Camp. I am so thankful for the pastor, John Hinkle, and the people of Providence Presbyterian Church, for allowing us the opportunity to use their facilities. Neither are something we achieve on our own, and according to Galatians, these fruits come from the Spirit, not ourselves. It isn't the fruit of Ken but of what God is working in and through us. It is something I'm thankful Scouting allows us talk about. May I Ask: Where do you see evidence of the Fruit in your life? Where do you see it in others around you? May I Suggest: In keeping with the Spirit, build others up. Take time today and tell someone one Fruit you see in their life. Encourage them!